WakeOnLan Free is free Wake on LAN (WOL) tool, that can help you to make a centralized wake up of multiple remote PCs. WakeOnLan Free is ready to work in complex networks and power up PCs across subnets. It is able to detect MAC addresses of remote PCs and send Wake on LAN packets using different transmission methods. Using Professional version you can not only execute WOL on demand, but also schedule WOL tasks for an automatic execution. ...... WakeOnLan Free features an automatic MAC addresses detection mechanism, so you don't need to enter MAC addresses of remote PCs manually. * Wake up PCs from the central location. WakeOnLan Free is designed to manage multiple PCs and power them up with just few mouse clicks. * Wake on LAN across subnets. WakeOnLan Free can be used in complex networks and allow you to configure WOL transmission methods depending on your network configuration. * MAC addresses detection. 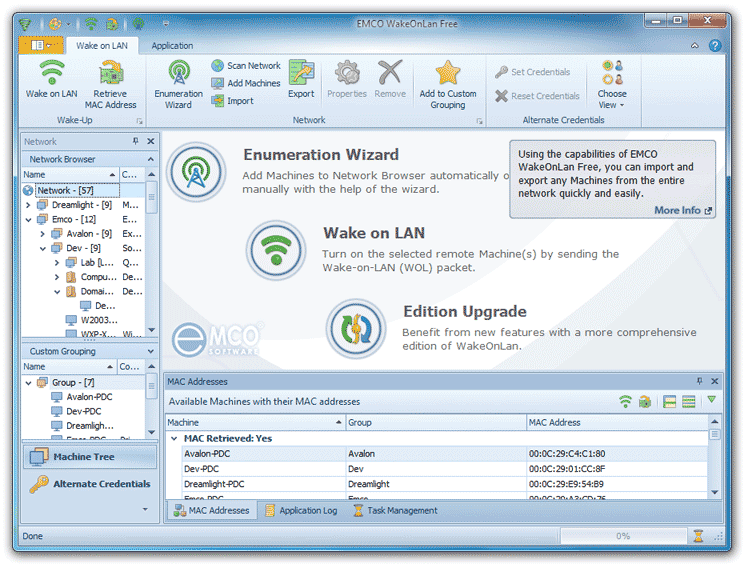 You don't need to enter MAC addresses of remote PCs manually. WakeOnLan Free detects them automatically using a few methods. Qweas is providing links to WakeOnLan Free 1.0.5 as a courtesy, and makes no representations regarding WakeOnLan Free or any other applications or any information related thereto. Any questions, complaints or claims regarding this application WakeOnLan Free 1.0.5 must be directed to the appropriate software vendor. You may click the publisher link of WakeOnLan Free on the top of this page to get more details about the vendor.